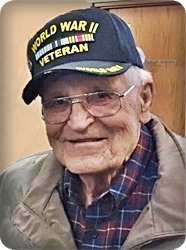 Ray Allen Pell, age 91, of Grand Rapids, went home to be with his Lord on Friday, November 16, 2018. Ray proudly served his country in the U.S. Navy during WWII. He was preceded in death by his wife, Freda; daughters, Kathy Pell and Michele Dozeman; sister, Ilah Hall and her husband, Carl; and brother-in-law, Glenn Speet. Ray will be lovingly remembered by his children, Nancy and Dennis Schreur, Keith and Jan Pell; grandchildren, Kim and Jeff Barr, Andy and Tara Schreur, Pete and Annie Schreur, Karen and Todd Hoekstra, Rob Pell, Jamie Pell, Mike and Lisa Dozeman, Katie Dozeman; 16 great grandchildren; sisters-in-law, Helen Wissner, Betty Speet; nieces, nephews, and friends, including a special neighbor, Marsha McKeown. The family will greet visitors on Sunday, November 18, from 5 - 8 pm at Stroo Funeral Home, and on Monday, November 19, from 1 - 1:45 pm at Cutlerville East Christian Reformed Church, 501 68th St. SE, where the funeral service will begin at 2:00 pm. Rev. Allen Petroelje will officiate. Military Honors provided by the Kent County Veterans Honor Guard. Interment will be in Blain Cemetery. Contributions in memory of Ray may be made to the Pine Rest Patient Assistance Fund.